Last remaining 300,000 original remembrances of historic 1994 election. 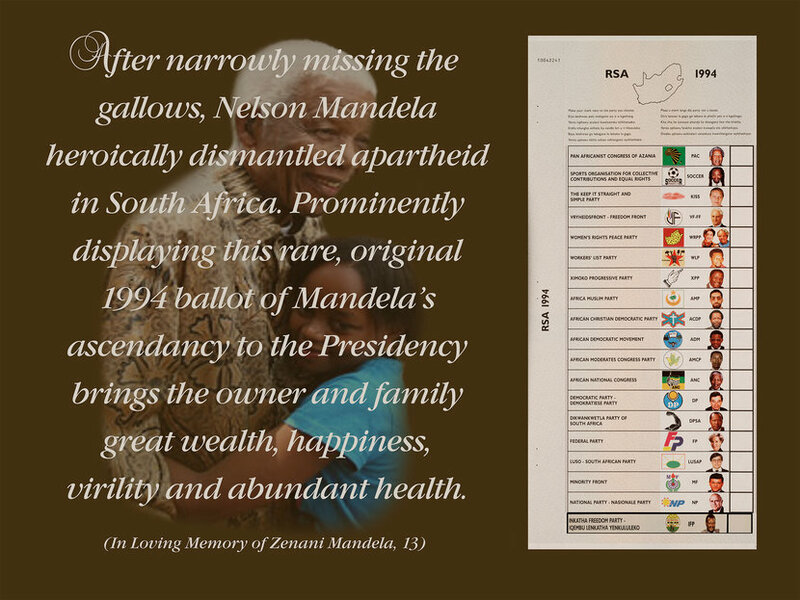 1.5m ballots purchased directly from South African Government in 1994. Pictorial of Mandela, watermarked, numbered, hand-applied IFP sticker. We offer a choice of 1994 original artwork ballots - National & Provincial: Natal, East Cape, West Cape & PVW (Gauteng). We ship original artwork in postal tubes to protect & preserve their integrity. Dimensions of framed artwork are 24" x 31". We also offer giclee prints of ballots. The National & Provincial ballots were printed before the election. Inclusion of the IFP candidate meant that just days before the election, rolls of stickers were printed with the IFP party information & candidate image. These were to be attached by poll workers before distribution to each voter. Since our ballots never arrived at the polls, the IFP candidate stickers were never attached to these original ballots. We hand-apply each IFP sticker individually to proximate as nearly as possible the condition and intensity of the moment when ballots were handed to first time voters.